Watsonville, CA -- The guides and entry forms for those who enter their best in this year's Santa Cruz County Fair are readily available. This is good news for those who wait until the end to get their paperwork to the Fair office. 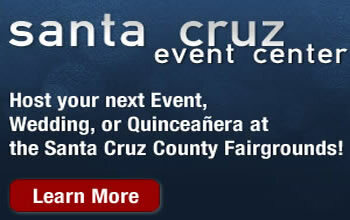 The complete Exhibitor’s "Entry Guide" can be accessed on line at www.santacruzcountyfair.com. In addition the guide can be found at the Fair office located on East Lake Avenue (Highway 152) in Watsonville. Included in the Exhibitor’s Guide is an entry form that must be returned to the Fair office by Saturday, August 7, 2010. To make it easier to return the forms an on line system has been set up to accept entry paperwork and the Fair office will be open Saturday from 9-5. The divisions open for exhibit entries range from Floral Arrangements to Photography, Poetry, Sewing, Pies and Cakes and home grown Fruits and Vegetables plus dozens more. Exhibit questions should be directed to the fair office by calling 831-724-5671. Don't forget the entry deadline for most categories is Saturday, August 7, 2010.